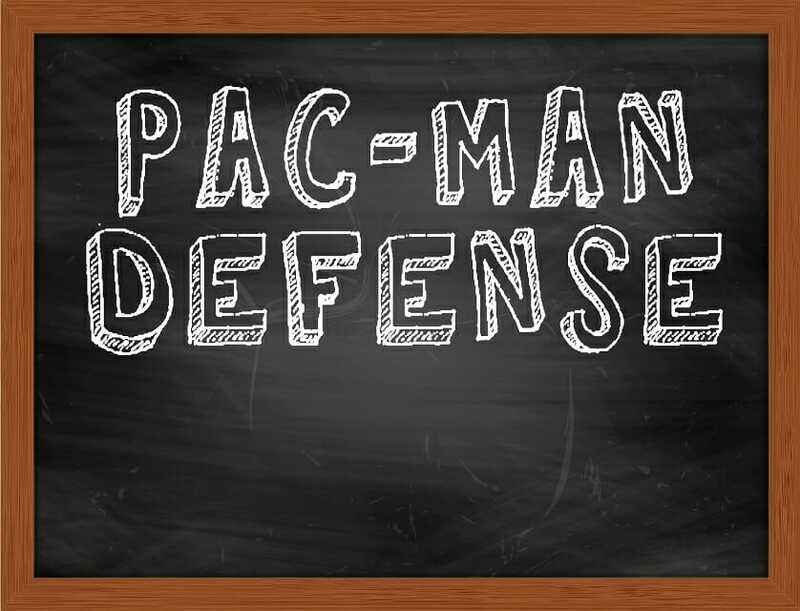 What is the Pac-Man Defense? The Pac-Man Defense is a strategy used by targeted companies to prevent a hostile takeoverAsset AcquisitionIn an asset acquisition, the purchasing company identifies which assets and liabilities it wants to purchase, as opposed to a share acquisition where an entire company is acquired. The transaction can be far more flexible in its structure. This takeover prevention strategy is implemented by the target company turning things around by trying to take over the acquirer. 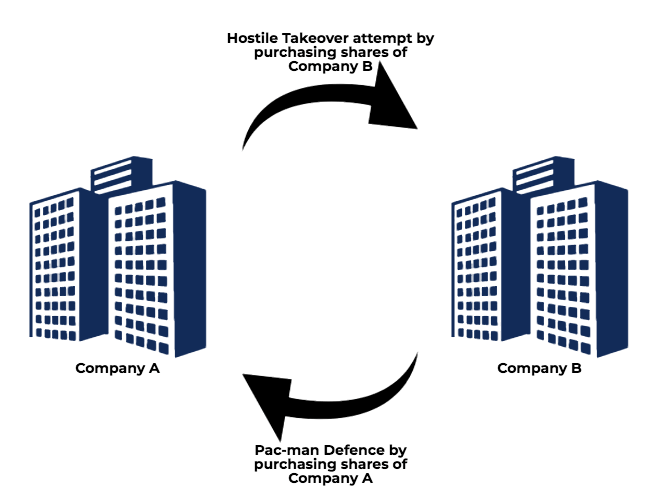 The purpose of the Pac-Man Defense, as with any defensive strategy against a hostile takeover, is to make a takeover very difficult for the acquiring company, in hopes that it will abandon the attempt. To learn more about M&A Transactions check out the FMVA™ Program.FMVA™ CertificationThe Financial Modeling & Valueation Analyst (FMVA)™ accreditation is a global standard for financial analysts that covers finance, accounting, financial modeling, valuation, budgeting, forecasting, presentations, and strategy. Company A is attempting a hostile takeover of Company B by purchasing sharesStockholders EquityStockholders Equity (also known as Shareholders Equity) is an account on a company's balance sheet that consists of share capital plus retained earnings. It also represents the residual value of assets minus liabilities. By rearranging the original accounting equation, we get Stockholders Equity = Assets – Liabilities of Company B, with the goal of obtaining a controlling interest. Company B realizes this and employs a Pac-Man Defense by using its assets to purchase large numbers of shares of Company A. Company A sees the potential risk of being taken over by Company B and decides to abandon its hostile takeover attempt. In essence, the Pac-Man defense responds to a hostile takeover attempt with a hostile takeover attempt. A real-life example of this occurred between 2005 and 2012 when Porsche attempted, but failed, to buy enough stock shares to acquire a controlling interest in Volkswagen. When Porsche fell on financial hard times in the aftermath of the 2008 Financial Crisis, Volkswagen ended up turning around and buying up shares of Porsche on the cheap, enabling it to take over Porsche altogether by 2012. Recall from the Pac-Man game that the player must avoid ghosts that are trying to chase and eliminate the player. In the game, if the Pac-Man consumes a power pellet, he or she is able to turn around and eliminate the ghosts. In the Pac-Man takeover defense, the target company “eating” shares of the acquiring company is analogous to consuming a power pellet. The defensive strategy gives the target company the power to fend off the hostile takeover. The Pac-Man Defense was so named because the companies involved are, similar to the action in the game, “gobbling” each other up. For a company to use a Pac-Man Defense effectively, the target must possess substantial resourcesFinancial AssetsFinancial assets refer to assets that arise from contractual agreements on future cash flows or from owning equity instruments of another entity. Financial instruments refer to any contract that gives rise to a financial asset to one entity and a financial liability or equity instrument to another entity, since it is attempting a hostile takeover of its own. The target must have the finances available to purchase enough shares of the potential acquiring company to be a credible threat to the acquirer’s control of its own firm. Selling its own assets: The target company can use existing cash or cash equivalent assets or sell off non-vital assets to generate enough money to buy large amounts of shares of the acquirer. Selling non-core business units: The company can sell off non-core business units to generate cash. Borrowing cash: The company can borrow cash from lenders or by issuing bonds or additional stock shares. The latter method of financing offers the additional benefit of diluting the target company’s outstanding stock shares, so that the acquirer would have to purchase more shares in order to obtain 50%+ of the total outstanding stock of the target company. War chest: A war chest is a cushion of cash stored by the company in the event of adverse events – a sort of emergency expenses fund. It typically includes assets that can be easily liquidated to produce cash such as bank deposits and T-Bills. Using war chest financing for a Pac-Man Defense is essentially just saying that the target company is using its excess cash or cash reserves. The Pac-Man Defense is a very aggressive and extremely expensive strategy, as it usually involves selling off assets or non-core business units, or increasing the company’s debt in order to put the strategy into action. Shareholders suffer in the aftermath if the target company is forced to sell important assets, losing value. The most famous example of a company using the Pac-Man Defense is also the origin of the term. In 1982, Bendix Corporation tried to take over the aggregates and heavy building materials firm, Martin Marietta, by obtaining a controlling interest in Martin Marietta stock. Martin Marietta’s management sold off multiple business segments and borrowed over $1 billion to fight the takeover attempt. Bendix Corporation owned over 70% of Marietta’s stock while Marietta bought over 50% of Bendix’s stock through a tender offer. This fight damaged both companies as they expended huge amounts of cash to buy each other’s shares. In the end, Allied Corporation acted as a white knightWhite KnightA white knight is a company or an individual that acquires a target company that is close to being taken over by a black knight. A white knight takeover is the preferred option to a hostile takeover by the black knight as white knights make a 'friendly acquisition' by generally preserving the current management team and acquired Bendix Corporation.